When I last visited the Monterey Bay Aquarium in Monterey, California, my primary interest was jellyfish. I wanted to create the effect of an image you might see in astrophotography similar to photographs of deep space nebulae. I waited for this jellyfish to move into good light. 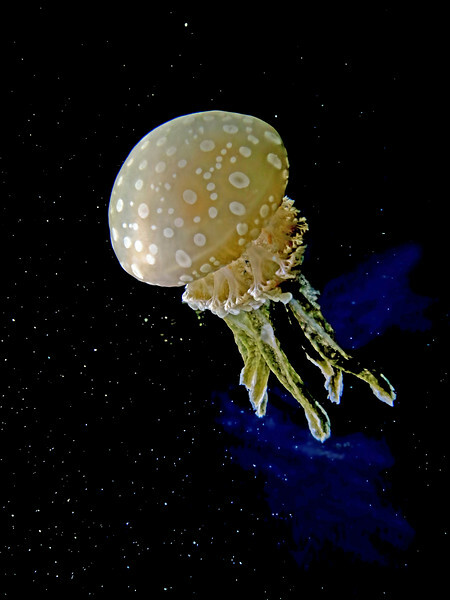 By making adjustments to the camera settings, the jellyfish remained well-lit while the area surrounding the jellyfish darkened. The particles floating within the tank took on the appearance of "stars" and the lovely patch of blue is due to the color of a wall within the display. Taken hand-held, no cropping. The background does look like dark space, with stars. The Jellyfish is illuminated and stands out well. This cheered me up early this morning as it is very cold and misty here. By making adjustments to the camera settings, the jellyfish remained well-lit while the area surrounding the jellyfish darkened. I'd be very interested to know what adjustments you made to achive this. I have noticed that many of your bird shots also have a dark background. I'm glad you like this image, Barrie. Thanks for looking and commenting. Whether it's indoors (jellyfish) or outdoors (birds) the "camera settings adjustments" I depend on most to acheive the desired look I favor in my photography are very fast shutter speeds, very heavy use of negative exposure compensation and low ISO. Essentially, anything that helps to darken the scene. The jellyfish was in a very dark environment to begin with, which helped in this case. My favorite type of image involves the use of "side-lighting" of the subject. During early morning or late afternoon hours I simply take advantage of the position of the sun. I place myself in a position so the sunlight is mainly striking the subject from the side. In this way, the subject is typically half in sunlight and half in shadow. Think of a first quarter or gibbous moon, for example. Additionally, the black backgrounds you see in my images require that the area especially behind the subject be fairly dark to begin with. I start decreasing the Exposure Compensation value until the foreground and background begin to "disappear." In this way, plenty of sunlight remains on the subject and areas around it begin to darken. I make adjustments until I like what I see. Now I have a good "foundation" image to work with during post-processing. I use Photoshop Elements 12. During post-processing I first select a one-click AUTO LEVELS or AUTO CONTRAST depending on which looks best. Then under "ADJUST LIGHTING" I simply decrease the LEVELS until all hints of the information around the subject goes completely black. The subject still remains in "good light" while everything else in the frame is now black and I'm left with the images you see on my website. That's it. Thanks for the explanation Tony. It looks like you have got it off to a fine art. I'm also a great fan of power zoom bridge cameras. I will have to try your technique with mine and see how they turn out. Although we may not own the same camera you might find one or two things of interest with regard to how I specifically use my superzoom camera. I'd love to hear ideas, hints, tips & technique strategies from you and others here, as well. Last edited by Tony Britton; 06-11-17 at 03:09 PM. I see from your profile you also have a Sony DSC-RX10 M3. How do you rate this camera and have you any example of the images it produces to share with us. I have looked at this camera and what puzzles me is why there are so many secondhand ones on eBay that are still in waranty. Do people find them below expectation and can't wait to off load them. I haven't a clue as to why there might be so many available on eBay other than Sony just released the M4 version of the RX10 series. Apparently, Sony provided worthwhile improvements, none of which I've investigated yet since I couldn't be happier with my M3 and have no immediate plans on selling it. While I haven't owned my M3 very long, and I simply compare it to the others I own, then I'd say it's superior. My opinion is based upon a subjective, non-scientific side-by-side comparison. I can see a noticeable improvement in the amount of detail and lack of noise at higher ISO, finding and locking focus in low-light conditions, which makes sense because it sports a 1 inch sensor (my others have smaller senors) and the Bokeh effect this camera can produce is amazing. The most difficult "comparison trap" for me when I purchase a new camera such as my Sony and compare the images to my other cameras is not being swayed by the quality of the composition, environment and lighting conditions in which I photographed the subject. It's tempting for me to ignore any technical improvements that may be there and naturally gravitate toward the more asthetically appealing composition and subject. Therefore, even though I notice improved amounts of detail and improved performance with the Sony, and when I compare photos from my previous cameras then I'd say I've yet to capture a memorable composition and certainly one that might be considered a good candidate for submission for possible publication. Of course, that's not the fault of the Sony, just a current lack of luck and opportunity! Last edited by Tony Britton; 07-11-17 at 03:10 PM. Thanks for the info Tony. It was very nice to see the splendid images you have produced. I was also pleased to see what you have turned out using the Nikon. To be honest at the size viewable on the web, there is little to choose between any of the cameras you use. I compliment you on your style of photography and the method you use to produce these amazing images.